Why did we read this book: Thea read and had mixed feelings about Ice – loving the concept and first half of the book, but not the latter portion. Meanwhile, Ana had been eyeing SBD’s books but never got around to reading any of them. 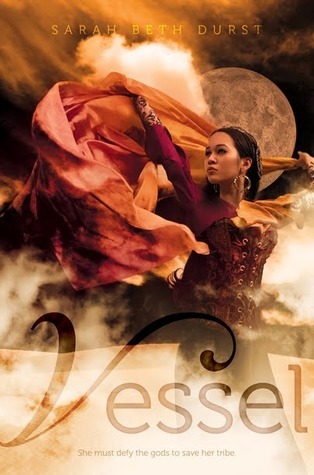 And then there was Vessel, with its gorgeous cover and fantastical plot. We both had to give it a try. Thousands of years ago, the people of the turtle made the desert their home and divided into several clans. It was a difficult way of life and many people died in the harsh desert. Those souls of the first dead wandered around our world until they found the Dreaming, where they remained. But the souls could not rest in peace in the Dreaming when they could see how their people suffered in the desert. And so it has come to pass that the souls of the dead ancestors, using the magic of the Dreaming, created the Gods – one for each clan. And now, every hundred years they send the Gods’ souls to walk around their people so they can help them survive. But the souls of the Gods cannot inhabit just anybody – they must enter the bodies of a Vessel, a person who has connections to the Dreaming and to magic. Liyana is the current Vessel of her clan and has prepared her whole life to be the vessel of her Goddess. She loves her life and her family but she is prepared to sacrifice herself and to die so that her clan can live, especially now with the Great Draught. The day arrives for her Goddess to come and Liyana says goodbye to her family and to her clan, then dances the night away calling for the Goddess. But her Goddess never comes. And although she has done every single thing right, although she has danced with a pure heart, her clan deems her unworthy and leave her behind. She is devastated and expects to die alone in the desert. Until a God walks into her life – he is Korbyn, the trickster God, inhabiting his own vessel. He brings news that some of the Gods (including Lilyana’s) have been kidnapped. They say need to find their vessels and then go in search of the missing Gods and Goddesses. In the meantime, the Emperor of the people-not-of-the-desert is also finding a way for his own people to survive the Great Draught – and will stop at nothing to make it happen. Vessel is an absolutely brilliant book and I found very little to criticise. It reads a lot like an old-fashioned adventure Fantasy and it features a very thought-provoking premise. Everything works here – the lovely writing, the well developed world-building, the vivid desert setting and the characters. Lilyana, is an absolutely fabulous character: ever so practical, determined to do her best for her family (especially her little brother) even as she is trapped between wanting to live and knowing she must sacrifice herself. In that sense, the most striking aspect of Vessel is how thought-provoking it turned out to be. This is a story full of questioning and the author incorporated this questioning really well into the narrative – in the way that the story is told, with the way the characters interact with each other and with their world. The premise – the thing that these Vessels MUST believe, as they have been told all their lives is that 1) the desert clans cannot survive without the magic of their Gods and 2) the Vessel must die so that the clans can carry on living. But are those things even true? I thought fascinating how, as the story progresses and as Lilyana and the other Vessels interacted, different facets of these “truths” were disclosed. From different ways of thinking and different ways of living to how each clan is different and how they treat their Vessels differently. The Vessels themselves are portrayed with variety: there are those who don’t question anything, those who are completely dedicated to their Gods, those who do not want to die or even care about their Gods. And of course, there are the Gods themselves – to some they are benevolent creatures, to others they are but leeches. Although the better developed God-character is Korbyn (and who doesn’t love a trickster God) , the other Gods and Goddess all embody different aspects and act accordingly – some love the people they come to save, some only care about enjoying a body once again. Do the Gods even need the bodies of the Vessel to work their magic? Is there even logic to all of that? In addition, there are great discussions about tradition, faith, destiny and survival. The presence of the Emperor – a young, charismatic leader – brings a bit of politics to the proceedings: should all the peoples unite against a common enemy? Or should they fight for their independence no matter what? There is no easy solution to this question and as such none is presented here. There is also an incredible amount of importance given to stories and storytelling within this world. Often Lilyana will tell traditional stories of her people which in turn, bring up other questions. How do you interact with the stories and the myths – are they supposed to be seen as truth? Are they supposed to be lessons? What do you take from those lessons? On the down side, the Emperor is not as a fleshed-out character as he should have been. And the romantic development (as “right” as it turned out to be) between certain characters was perhaps too abrupt and underdeveloped. Those things said, they did not detract at all from the reading experience. In summation: I really, really loved Vessel and think it is a superior, welcome addition to the YA Fantasy ranks. I wholeheartedly agree with Ana – Vessel is a beautiful, thought-provoking, brilliant gem of a novel that I loved from beginning to end. In fact, I think I’ll come out and say it – it easily makes my shortlist of notable reads of 2012, and may even hit the top 10 list. Suffice it to say: I loved this book. Ana has already talked about the awesome writing and questions that the novel poses, observations that I echo. I love that while Vessel is a fantasy novel about a girl whose destiny is thwarted and who finds her own way to help her people, it is also a parable about growing up. When Liyana is young, she – like everyone else in her clan – unwaveringly accepts her tribe’s way of life, their beliefs and traditions. She does not want to die, necessarily, but she knows that by letting her goddess Bayla use her body as a vessel, she will be saving the lives of her clan, as countless vessels have done before her. When Bayla doesn’t come as summoned, however, everything that Liyana has held as simple truth, everything she has been taught and told is challenged. And isn’t that the way it always works? Gods or Goddesses aside, Liyana’s eye-opening journey about the history of her people and the infallibility of her deities and elders is one with any reader can identify. Another standout feature of Vessel are the characters themselves: protagonist Liyana, the big-hearted trickster god Korbyn, the other vessels Pia, Fennick, Raan, and the mysterious Emperor himself. Liyana, our heroine, is sorely tested throughout – abandoned by her clan (but given a chance at survival by her loving family), abandoned by her goddess, she must fend for herself in order to survive. Even when she is joined by the trickster god Korbyn (who was able to make it to his vessel safely), Liyana remains calm and in control, grounded in her own sense of self and always remembering that she is a vessel and that she must find her goddess Bayla. I love how her perceptions of both her world and herself change over the course of the novel, as Liyana clings stubbornly to her desire to live – and why shouldn’t she? The other vessels are also given life and depth, from Fennick of the horse tribe and his brawny pigheadedness – but with a heart of gold beneath his bluster – to Pia, the beautiful blind songstress who is a haughty princess at first, but a true pure and perceptive soul. Of course, my favorite other characters are Korbyn, the beguiling trickster who comes to care for Liyana as more than just the vessel for his beloved Bayla, and Raan, the stubborn, questioning contrarian of the group. Raan is the only one that voices her defiance of being a vessel, who questions why she must die – which comes into play in the pivotal climax of the novel. And the plotting! Vessel is an adventure novel, spanning the desert and another empire, even to a forbidden lake of magic and the creatures that guard it. The plotting and worldbuilding in this book are truly masterful, unique and utterly memorable. Ultimately, Vessel reminds me of the great sweeping works of adventure fantasy that made me fall in love with the genre – and Vessel will be placed on my beloved books shelf, right in between my collection of Jacqueline Carey and Rachel Neumeier novels. On the day she was to die, Liyana walked out of her family’s tent to see the dawn. She buried her toes in the sand, cold from the night, and she wrapped her father’s goatskin cloak tight around her shoulders. She had only moments before everyone would wake. She fixed her eyes on the east, where the sky was bleached yellow in anticipation. Shadows marked each ridge, rock, and sand dune. Overhead, a few stubborn stars continued to cling to the sky, and a raven, black as a splinter of night, flew into the wind before angling toward the dark peaks of the distant mountains. Liyana felt the wind caress her cheeks and stir her hair. She’d left it loose last night, and she’d counted the strands when she couldn’t sleep. The wind stirred the sand at her feet, and it whistled over the dunes and rocks. She listened to it so intensely that every muscle in her body felt taut. She had wanted to be calm today. She’d heard a tale once about a man who had caught the first drop of sun. He’d kept it inside his lantern, and he never felt fear again. In his seventieth year, he was struck by a cobra, and he embraced the snake and called him brother — and then he died. Liyana thought he should have sliced the snake’s head off so at least the cobra wouldn’t bite the man’s family, too, but then again Mother always said Liyana had a decidedly practical streak in her. Additional Thoughts: Sarah Beth Durst is our guest today, talking Inspirations and Influences. Make sure to stop by her post HERE. I am *so* glad that you guys loved this book. It’s been on my to-watch list for so long, and I had such high hopes that the execution would live up them. I feel confident in reading it at some point now. ^_^ Plus, I LOVE the religious questioning in fantasy like this. I cannot wait to read this book! I have had my eye on it for a while. I’m so glad you two enjoyed it. I’m hooked. The history and the belief system really sets the stage. From the third line in I was hooked. This review has prompted me to start a list of 2012 releases I MUST read before the end of 2012. She was actually at Books of Wonder in NYC for an event yesterday, but alas, I was just too lazy to make the trip (kind of regretting that now).